Not more than a month ago I was trying to decide which genealogy event to participate in this year. I was very excited because this would be my first time going away for a week for genealogical training. I sat down with my husband and we discussed the dates and the costs. In the end we settled on the National Institute of Genealogical Research (NIGR) in Washington DC during the third week of July. I was over the moon! Last week the application arrived in the mail and I was getting ready to finalize my plans. Everything seemed on track. Then the call came. The first one was from my brother. The second one was from my Dad. We had the opportunity to spend two weeks together on a family vacation on the coast thanks to a cousin offering us her house. I readily agreed that the last week in July would be fine. But I wouldn't budge on that third week, the week of my institute. I spent time talking to my Dad and he really wanted us to go for both weeks. I did some quick re-thinking. Perhaps I could go to another institute. GRIPitt perhaps? I really wanted to go to that anyway. No luck. That one takes place during the fourth week of July which was still during the family vacation time. I gave it some really serious thought. 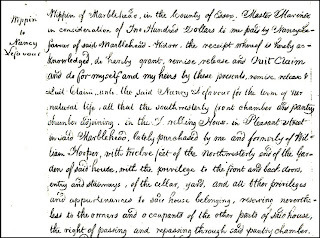 I had an institute, my first real institute, nearly in the grip of my hand. It will have to wait for another year I suppose. Ultimately, I decided that the time my three boys can spend with their grandfather is more important than my need to go to a genealogy institute. The chance for them to spend two whole weeks with their grandfather in one of the most beautiful places in the world and one that is so special to our family outranked everything else. Yeah, I am so sad but life is about choices. Our ancestors had to make far tougher choices. I will be celebrating the present and building memories for the future instead. I was just reading the Journey to the Past Blog by Brenda Leyndyke. In her most recent post "Recommendations for Genealogy Education And Assessing 2012 Goals" she talks about various forms of genealogy education, particularly the ones available on the internet. She also runs through the educational classes she has taken during the month of February. Let me tell you she covered a lot of ground! Brenda's focus was primarily on live webinars and recorded online videos. She's right - there is so much available online these days that it is very easy to broaden your knowledge of genealogy without leaving home. 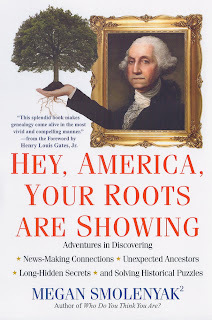 But there are lots of other genealogical learning opportunities such as magazines, peer reviewed journals, books, in-person classes, institutes, conferences and seminars. I'm sure there must be others as well. I thought it would be interesting to stop and ask everyone to consider where they get most of their genealogical education. Is it from one of these sources or from something else? Are you finding that you are shifting from traditional sources to webinars and videos? Or are you sticking with books? Does your own personal learning style play into this? By that I mean do you still prefer in-person classroom learning, are videos more visually helpful or is there something else that suits the way you learn? I can't wait to hear what you have to say. For myself I think I have adapted to all learning opportunities. 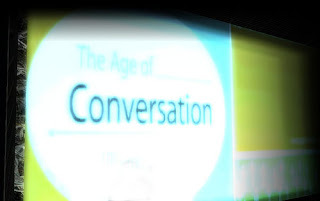 I like face to face learning but I can take away a lot from videos and webinars as well. I still do an extensive amount of learning in books and journals. As long as it makes me think and I learn something new then I find it worthwhile. Though I'm not so sure that I would like participating in an online class (as opposed to in person). Looking forward to hearing which educational opportunities you are taking advantage of! Photo Credit: Photo by cdsessums and used under the creative commons license. I've always heard family historians say that their ancestors' names were changed by the clerks at Ellis Island. And I've heard numerous talks by professional genealogists disputing this fact. 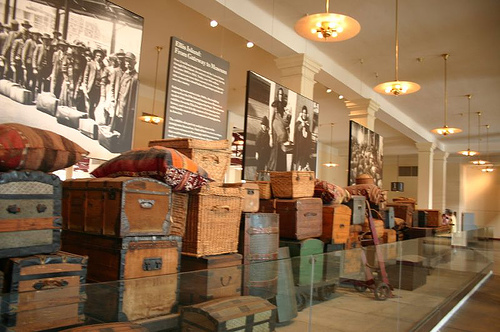 They say that name changes did not occur at Ellis Island. In my own probate talks I've demonstrated how many people did change their names - in the court system. Recently I was browsing through my mother's collection of genealogy books. I happened to stumble upon Ancestry's Guide to Research: Case Studies in American Genealogy (Ancestry, 1985) by Johni Cerny & Arlene Eakle. I decided to pull it out and give it a read. "Cerny, a Slovakian surname that is spelled Cierny, denotes the color black. Jan Cierny (pronounced chair-nee) had his name changed when he arrived in the United States to John Cerny (pronounced sir-nee) by Ellis Island processing clerks. His wife had her name changed to Theresa Zahorec." Both Johni Cerny and Arlene Eakle are respected professional genealogists. Are they right or is this a mistake? So I ask - What is the definitive answer about name changing at Ellis Island? Did name changes occur or not? Photo Credit: photo by Jeff Pearce and used under the creative commons license. This year I made it my goal to try to get better organized and to digitize my photos. This past weekend I made inroads toward that goal by scanning up a storm. My father recently gave me a photo album from my great grandparents with photos taken between 1901 and 1912. These photos are wonderful because they show the family at play on vacation when they are their most relaxed. Prior to this I had seen mostly formal shots that gave me no indication of their personalities or their interactions with each other. I got out my Flip Pal and tore through 160 photos. That's quite a lot of photos to scan! The original photos weren't in great condition so now I am in the process of correcting/improving them in Adobe Photoshop. After I complete that task I will share the digital copies of the photos - both the original and corrected versions - with all my family. The important thing is not that they do anything with the photos but that multiple copies are preserved in several different locations. The other key thing is to make sure all descendants who want them have copies of the photos. I still need to do work on acting as the family archivist. I need to catalog the photos/album, note the provenance (the chain of ownership) of the photo album and identify where the original physical copy will be kept. That's next on my list! But I feel good. I feel like I got something accomplished and I'm glad that the line of communication is open with my other family members so that they can get excited too. 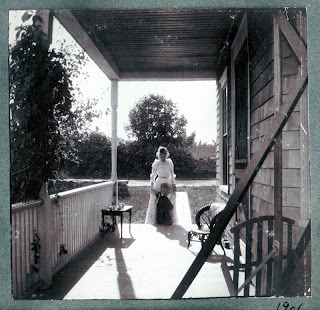 This album is just one pebble in a riverbed of scanning and cataloging that I need to do. Small steps. Each small step will get me closer to my goal. Photo notes: These photos show Sarah Estella Gurney Edwards (1871-1963) helping her young son, William Henry Edwards (1898-1976) up the front porch steps during a family vacation in 1901. 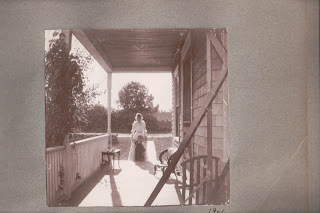 The location is unidentified but is likely the south coast of Massachusetts or Rhode Island. Yesterday, I asked "What format do you prefer for genealogy information?" I am always taken aback with what strikes a cord with readers. Apparently that one did. I had many comments on the blog itself as well as on Facebook, Twitter and Google+. One thing that surprised me was how many people are either completely digital or mostly digital in their genealogy research. That's not a bad thing just not exactly how I operate. Let me bring you a more specific scenario and see how you respond. When you are working on a specific challenge or brick wall how do you go about your analysis? I am not talking about regular fact finding genealogy research where you gather information about ancestors. I'm talking about that one (or two if it is a husband and wife/father and son, etc) ancestor that stops you dead in your tracks and makes you think. When I am working on a really tough problem I can't work from my database or my digital files. I need to see the relevant documents spread out in front of me, side by side. I need to be able to read documents over and over in case I've missed something. I have one document, a deposition, that I acquired five years ago that I am still reading and gleaning information from. I just can't do this sort of thing electronically. I can do background research online, create a research plan on the computer, type up my notes in a word processor, etc but I have to do this on paper. Even if all the documents were stored in a software program, I couldn't bring them up on the computer side by side big enough to compare them. So, tell me, am I unique in needing visual print outs for this kind of analysis? Are the rest of you doing this on the computer? They say there are different styles of learning. Maybe there are different styles for analysis too. But I was really surprised by all of you who keep everything stored solely in the computer. What Format Do You Prefer for Genealogy Information? Last week I gave a webinar called "10 Brick Wall Tips for Beginners." The first point in my webinar was reviewing your data and looking at it with fresh eyes. That got me thinking. What format *is* your genealogy information in? I am really curious to know. 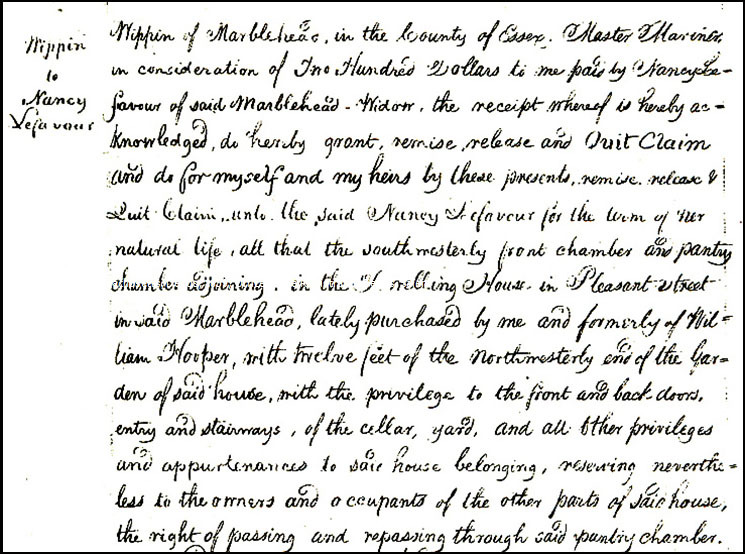 Is your family history handwritten on paper? Is it written out as text in a word processing document? Is it on random papers and stuffed in manila folders? Is it all kept in a software program (that is hopefully backed up!)? Maybe index cards? Or something else? When I started out in genealogy I put everything in my genealogy software program and stuffed random papers in manila folders. As I became more experienced, I still used the software program but now do more in a word processor. My personal genealogy reports include my objective/task, what I searched, what I found from those searches and my conclusions up to that point. I find those are really helpful with brick walls that are researched over a long period of time. It's hard to keep all the information in my head and the research report helps remind me quickly where I left off. 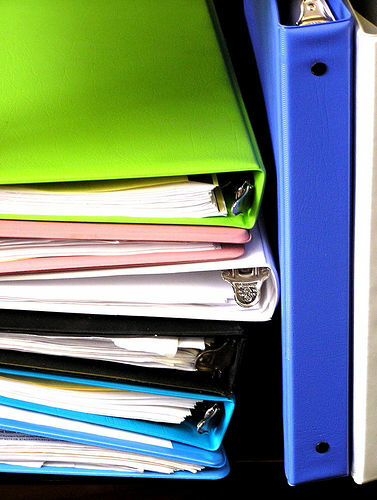 I used to fight the urge to use 3-ring binders and sheet protectors. Now I have caved into it. When I am hot on the genealogy trail I need to be able to access and review my documents quickly. Stuffing them in a manila folder doesn't let me flip between the documents easily. As I am processing and analyzing I sometimes flip through the information hundreds of times. I also print out pedigree charts and family groups sheets and put them in my binder so that I am not dependent on a computer for a quick look-up. If you were to review your information as I suggested in the webinar, what format would you find your information in? How would you gather and sort through it? Photo Credit: photo by Muffet and used under the creative commons license. I've been either traveling or dealing with a hectic schedule the last two weeks. I finally had the chance to spend some time this morning catching up with Twitter. I like to check out Twitter first thing in the morning to get the buzz on what's going on in the genealogical community and the rest of the world. Since I am so far behind I had to take some time to sort through my list of new followers. This is decision time. Do I follow them back or not? Since Twitter can be kind of confusing until you get the hang of it I thought I would describe the process I go through to pick new people to follow. First off, let me say that if I don't follow someone back the first day, don't worry about it. I have a busy schedule and I'll get to it when I have free time. Some people live and breathe the "instantaneousness" of Twitter. If you don't follow them back right away, they unfollow you. I don't believe in that method. I don't live and breathe Twitter. It's a tool to serve me and I'm not going to get caught up serving it. I will say, though, that once I follow someone I am unlikely to stop following them. They would have to Tweet something offensive or be repeatedly annoying for me to go so far as to unfollow. So there you have it, I'm loyal if you can catch my attention. I don't follow private (locked) accounts. I say locked because it shows a little padlock to indicate that it is private. I see that you want to follow me, and that's great. I'm assuming you are new to Twitter and not certain about what is going on and that's why you prefer to keep your tweets private. I'm not going to go to the effort of requesting to follow you because I'm not sure if you would welcome it or not. If anyone has a private account and wants me to follow them back then they need to send me a private direct mail and invite me to follow them back. End of story. My first tier of decision making is your profile. It's that really brief sentence after your Twitter username and, hopefully, your real name that gives you a little chance to explain what you're about. People who leave that blank typically don't make the cut for me to bother with a second tier of decision making, especially if you haven't customized your profile icon. I follow most people who say something about genealogy or history. I will follow other people who have an interesting mix of topics listed or maybe even just something witty or intelligent. I don't necessarily decide simply based on the profile information. Next I will click through to see what your last 10 tweets or so have been like. If you say you like genealogy in your profile but then you have lots of tweets about getting a haircut or going to the grocery store then I will probably not follow you. I'm not looking for people who post just about genealogy. Your last 10 tweets could be on all different topics but they need to be interesting. Your day at the hairdresser is not interesting to me unless you happen to be a particularly funny person. Some people can pull that off, most can't. Twitter is a rapid fire environment and people make a decision to follow based on whether you are bringing added value. I followed a cartoonist once. He had nothing to do with genealogy or any of my other interests. But I found his profile and his tweets to be fascinating. That's what I want. Someone who will expand my horizons or give me something to think about. If you want more people to follow you make sure that 1) you have your profile filled out (check out other people's profiles to see what they do) and 2) make sure your tweets reinforce what you have said in your profile. If not, you might confuse people. Lastly, 3) let your personality shine through and tweet items that will be of value and interest to other people not just yourself. Last week I found myself driving to Wildwood, New Jersey. Wildwood is a resort town on the ocean at the very southern tip of New Jersey. It's a 6-7 hour drive from my home in Boston. I had never been there before but I heard that it's a fairly quiet place in the wintry cold of February. Before making the trip I happened to send an email to my uncle about my plans. He replied back to say that my great Uncle Chris and great Aunt Louise had been married in Wildwood in the 1930s! I had no idea. While I like to think that my brain is an endless repository of family history information, the truth is I can't always recall every detail off the top of my head. I checked my Legacy database and lo and behold there they were being married in Wildwood on August 12, 1937. Suddenly my trip to New Jersey took on new intrigue. A family event happened there and I needed to pay more attention. While researching family history is often a solitary event, in a broader view our work can't be done in isolation. Without the help of others we will never be able to find results as quickly or as thoroughly. It's important to let others - particularly relatives and old family friends - know that you are doing family history research. You will be surprised at the changes and results that come your way. Some family members, like my uncle, will have your back and alert you to relevant family information. These kind of informants are critical because there's no way you will be able to keep track of everything. Many of your relatives won't be interested in family history at all. But that's ok. These are the ones who will pass on family photos, documents and heirlooms when they no longer want to store them in their attics and basements. While they may not care about family history, these folks will feel guilty about tossing anything out when they know there is an acting family historian. Bring on the guilt and let them pass everything to you! The more you let people know you are the family historian (not just once - remind them at least once a year), the more likely you will amass a collection of the photos and information your are looking for. While you probably won't shout it from every roof top, do make sure you let people know. It will make all the difference in your research. 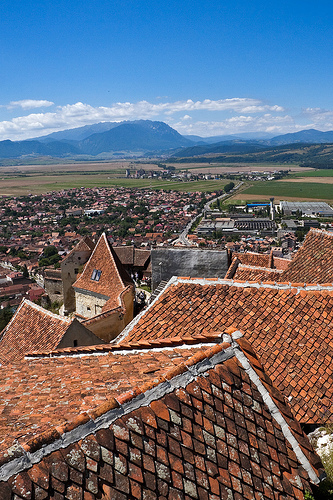 Photo Credit: photo by Horia Varlan and used under the creative commons license. I enjoyed last Friday's episode of Who Do You Think You Are? on NBC featuring actress Marisa Tomei. I'm not very familiar with her professional career but I found her to be very likable and genuine. While I don't have any Italian roots, her journey to Italy and the discovery of family stories was interesting and enjoyable to watch. Two key points struck me from watching this show. It's seem clear to me that the fourth generation is where the link breaks in families. Marisa had limited information about her great grandfather. It may be that events such as immigration or early death are really the factors behind these breaks. But none the less by the fourth generation family history information is either lost, forgotten or morphed into something erroneous (as it was in Marisa's case). This is where it transforms into the realm of oral history where we say it's based on a kernel of truth but not the whole truth. Marisa and her mother did have some of the story right about her great grandfather but the story shifted to have negative connotations which turned out to be untrue. Many regular people (by this I mean non-genealogists) can't name any of their great grandparents. Some even have difficulty with their own grandparents' names. Is it that we feel connected to the generations that we have known personally and anything beyond is simply history? Or have we given up trying to pass down a strong sense of family history that will continue from generation to generation? One of the most interesting aspects of this episode was that Marisa's mother was carrying some family shame because of what happened to Marisa's great grandfather and becuase she believed that he had somehow disgraced the family. It's interesting that someone who has been dead for three generations can impact the emotional well-being of the living. She was carrying around a very real sense of shame and yet it was not true. The great grandfather had not disgraced the family. In fact, the opposite was true. He was a man of honor and the person who killed him was the coward. It strikes me that emotions surrounding family history are powerful indeed if you can be weighed down by something you've been told that is several generations in the past. I wonder how many people are carrying a burden that is not founded on truth? Is the answer to withdraw emotional baggage from previous generations in a wholesale dump or is it better to try to seek out the truth for better or for worse? In this case seeking the truth worked out well but it many case I imagine it wouldn't. For me, this was a very thought provoking episode in these two regards. I'm sure I will continue to look for examples from others. If you've experienced either scenario in your family let me know. And let me know how it played out. I have been a little quiet on the blogging front this week. That usually happens when I have a webinar scheduled. I need lots of time to practice! Today's webinar "10 Brick Wall Tips for Beginners" was delivered to a "sold out" crowd and seems to have been a success. If you couldn't get a slot or you missed it for other reasons, the webinar is now available for viewing in the Legacy webinar archives. Just click that link and scroll down to the header where it says "Listen to Our Archived Webinars." It was be available to view for free 24/7 at your convenience for the next 10 days. Thanks again for all your comments, feedback and emails about your own brick walls. They helped immensely with choosing the content for this webinar and the Intermediate Brick Wall webinar coming this October. In the coming months I am going to be giving two Brick Wall webinars. The first is this Wednesday with a talk called "Ten Brick Wall Tips for Beginners" and then another in October with "Ten Brick Wall Tips for Intermediate Researchers." This afternoon I was thinking about the survey questions that would be asked before the start of each webinar. The survey questions help me gauge the level and needs of the audience. In the past I have given webinars and been surprised that they are heavily skewed toward a certain time frame or immigrant group. So I thought I would put a question out to you ahead of time so that I can better find tune both of my webinars. Please let me know if your brick wall(s) falls into any of these categories. If not, please let me know where the obstacle is so I can try to address the issue. Please help me by telling me a little about your brick walls (especially if you are going to be listening in on the webinars). Leave your note in the comments or send me an email. 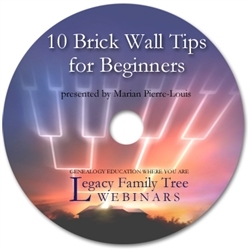 Click here if you would like to register for this week's free brick wall webinar. Each time there is an episode of NBC's Who Do You Think You Are? there are inevitably comments the next day on social media rejoicing in how wonderful the episode was or lamenting its lack of substance, or aghast, genealogy. The episode featuring Martin Sheen was no exception. I don't think there is any right or wrong just differences in personal taste regarding what people like to watch on tv. Ironically, when people don't like an episode because it doesn't go far enough back I tend to have the opposite reaction. The same thing happened for me last season with the Kim Cattrall episode. Let me explain why. The Martin Sheen episode focused heavily on his search for information on two of his uncles - one who lived in Ireland and one who lived in Spain. Though the last part of the show did dig back many generations to uncover an unusual connection between two ancestors. I can understand that perhaps some people might not have appreciated the stories of the uncles because it was only one generation back. I mean, that's not really genealogy, right?!! For me, the story of his two uncles was the essence of why most people start searching for their roots. It's a sense of connectedness to those in your family, known or unknown, who have come before you. Martin Sheen has a strong sense of activism in his personal belief system. He wanted to know where that came from. His uncle in Ireland fought and suffered imprisonment for a free and independent Irish Republic. His strong beliefs in his country shaped the path he took and helped bring independence to Ireland. Likewise, the uncle in Spain fought in the Spanish Civil War against Franco and also suffered for his beliefs and convictions. Martin Sheen never knew his Irish uncle and I get the sense that he didn't know the Spanish one very well. Yet his mother was sibling to the one in Ireland and his father to the one in Spain. I have a hard time believing that the pain they endured was not shared by Sheen's parents, the way family members ache when their loved ones suffer. Surely his parents may have spoken about them growing up. But certainly his parents' reactions to the world in which they lived, and the choices that they made, would have been colored by these dramatic events that happened to their families. I would say, yes, Martin, you have found that connection you were looking for. Beliefs, strengths, affinities are passed down. And isn't great when you actually have the opportunity to understand where they came from? Not all of us are that lucky but we still crave it. 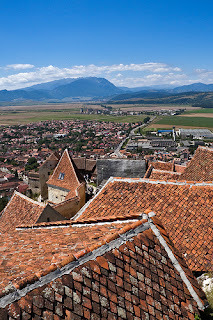 For me the sense of connectedness, the feeling a part of something bigger was the most profound reaction I had when embarking on my genealogical journey. Whether you get that connection one generation back or five it doesn't really matter. For this reason, I enjoyed this Sheen episode and shared in the satisfaction that Martin, for the most part, found what he was looking for. I will say, though, the only disappointing part for me was that they never mentioned what happened to the uncle in Ireland. Did he die young or old? Did he ever have a family? There was no mention of it and it would have provided nicer closure had it been included. I have yet to attend a national conference. I would love to but with young children and a busy schedule it just hasn't worked out for me. Instead I have focused on participating in one regional society and attending one large regional conference (the New England Regional Genealogical Conference - NERGC) which happens every two years. As RootsTech was approaching this year, I was watching all the excitement of the lucky attendees. In a moment of clarity (when I was able to put aside the envy) I realized that there are many wonderful opportunities closer to home that I haven't taken advantage of. I decided that I would remedy that by attending local seminars and talks. There are a lot of great opportunities right in my own back yard. This past Wednesday I took my first step toward seeking local genealogical opportunities. I attended the African American History & Genealogy Day put on by the New England Historic Genealogical Society (NEHGS) in Boston. What was even better was that this event was free. NEHGS held an open research day for all attendees and provided three top quality lectures. Unfortunately, I was only able to attend two. The first was a talk by David Allen Lambert. I admit to having a special affinity for David because many of his research interests overlap mine such as cemetery research and African Americans. Having done a lot of research on these topics I wasn't sure how much I would get out of his talk. Silly me. David is a master with an endless well of information on his core knowledge areas. And like me he combines his multiple interests into one talk, so not only did I learn about African American genealogy but he also included some cemetery research as well. If you ever get to the point of thinking you know enough on a topic go to a talk by someone who has been researching longer than you. You will be humbled and inspired. The second talk was by Alex Goldfeld the author of North End: A Brief History of Boston's Oldest Neighborhood. While the North End is today known as an ethnic Italian neighborhood, in colonial times it was home to the earliest African American community. Alex is a historian rather than a genealogist but he gave a superb presentation on a very early time frame that I am not expert in. He opened my eyes to many sources for 17th and 18th century research. Many people, especially professionals, go to conferences for the networking rather than simply the learning. Ironically, I learned more at this one day seminar than I have at some conferences. I'm so glad that I forced myself to take advantage of a local opportunity. Don't worry if you can't make it to far away conferences. There may be some terrific learning experiences right in your back yard. Be on the lookout for state and regional genealogical societies. Many societies provide talks once a month and can be a good source of learning. But don't limit your thinking to genealogy societies. Local historical societies and libraries frequently put on excellent history and genealogy programs. Don't wait until next year or the next big conference. Hop onto a search engine and find local seminars and talks in your area that can broaden your knowledge. I'm so glad I took that step. I regret that I haven't posted about this earlier but I have been so distracted with the RootsTech Conference. 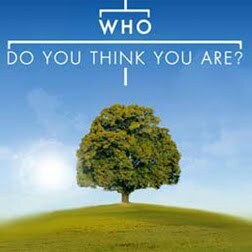 Season 3 of Who Do You Think You Are? starts tonight on NBC at 8 EST / 7 Central. Tonight's episode will be featuring Martin Sheen as he traces his ancestry. 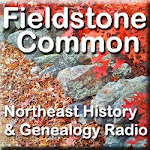 So join us tonight for tonight for some genealogy on mainstream tv! I am considering attending a genealogy institute or conference this year. I'm trying to line them up side by side so that I can make comparisons. The big factors for me are cost and location. Ironically, the programs closest to me are more expensive than the ones farthest away. I'll also have to take into consideration my family's schedule. But this is a good start. Registration has started or is starting soon for some of these programs so I'm hoping I can make a decision by the end of the weekend. The program I choose will depend very little on course content unfortunately and very much on my family schedule. Let me know if you have any thoughts, tips or advice on how to make my selection! Yesterday I spent the better part of the day attending the RootsTech Conference. I can hear most of you saying, "I thought she was skipping the conference and staying in Boston." Yes, I did stay in Boston but I absolutely did not skip the conference! And what a busy day I had. I think the only difference for me was that I didn't get to bump into lots of friends and colleagues. I started my RootsTech day off at 10:30am EST. That was 8:30am MST when the conference got started. 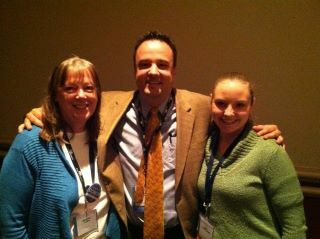 I attended the keynote session presented by Jay Verkler, President and CEO of FamilySearch. I was most impressed by the accessibility and video and sound quality of the live-streamed presentation. The presentation was viewable by simple going to the main url for the RootsTech Conference. The video quality made me feel like I had a front row seat to the keynote session. The sound came through clearly with no blips. The only bump was when they showed videos on a screen. This occurred twice. My internet bandwith couldn't keep up with live-streaming that included an extra video presentation within and at times it got blurry. Verkler talked about the future of genealogy in his presentation "Inventing the Future, as a Community." At various points during the presentation Verkler brought on stage folks from Google, brightsolid and one other company (regrettably I am forgetting the name). He clearly demonstrated not only a vision for the future but productive outreach to mainstream technology developers who are creating the future of software, the internet and services on the cloud. RootsTech is seeking to harness mainstream technology to push genealogy forward. This was shown by the demonstration of behind the scenes innovations that we every-day genealogists don't normally see. These include schema to tag genealogical records for easier delivery on search engines, improving the gedcom protocol and an innovative electronic way for compiling and sharing genealogical information on individual ancestors. The keynote session brought home why RootsTech truly is different from other conferences. It is one thing to share technology tips and completely another to embrace mainstream developers like Google and contribute to shaping the future of technology that will benefit genealogists as a whole. RootsTech should not suffer from an identity crisis about whether they are techy enough (as exemplified by their early denial of booksellers in the exhibitor hall). They clearly have technology covered and are providing a greater service by bringing all the technology partners to the table. This really is not your grandma's genealogy conference. At 1:00pm I snuggled up to my laptop to watch Josh Taylor present "Do I Trust the Cloud." I have to admit that Josh Taylor is one of my favorite presenters and I would be completely biased reviewing his talk. Josh tried to sell the audience on the concept of using the cloud for file backup and collaborating with other users. I think he succeeded in presenting a convincing argument all the while providing an interesting and entertaining talk. I strongly believe is using the cloud. I'm just not sure exactly how much information I want to put out there. As far as genealogy files are concerned, yes, they should definitely be on the cloud. Josh's talk was educational and reinforced the overall high level technology aura of the conference. I had to miss the third live-streamed presentation in order to give one of my own! Not only I am attending RootsTech virtually but I also participated virtually. At 3:45pm I was one of four contestants who competed for the ever title of Genealogy Idol sponsored by Legacy Family Tree Software. The hour was like 12 rapid fire webinars all in one. The other contestants included Elyse Doerflinger and Elizabeth Clark live at RootsTech and Michael Hait presenting virtually from Delaware. In three rounds the contestants had three minutes apiece to present their best technology tip, a serendipity story and their favorite genealogy or technology website. Although I was participating, I learned so much from the other presenters. The tech tip round was my favorite. Michael demonstrated a great tip on how to automate the creation of citations. I hope he will write it up as a blog post and share it with everyone. Elyse convinced me that I should give OneNote a try. Since I have the software already on my computer I really have no excuse for not trying it out. And Elizabeth gave a wonderful presentation on DeedMapper. Makes me want to call her after the conference to see if I can get a personal tutorial. In the end the audience voted via the survey question function in the webinar software. To my great surprise I was conferred with the title of Genealogy Idol. But all around I think all the contestants won and it was a resounding success. Thanks to Legacy for putting on the competition. I thought I had a fairly complete day after the Genealogy Idol competition but my first conference day wasn't over yet. I soon tuned in to Thomas MacEntee's presentation "Twitter - It's Not Just "What I Had for Breakfast" Anymore." While I know a lot about Twitter (being a social media junkie) I was very interested to hear the questions from the audience about what they wanted to know about Twitter. It helped me gauge how people are embracing social media and what their concerns are. I wrapped up the day watching a presentation by Barbara Renick. It was a bit of a sentimental journey for me because the first genealogy book I ever read was Renick's Genealogy 101. She presented a topic with an intriguing title "Eleven Layers of Online Searches." Her talk went into great detail about how to get the most out of FamilySearch and Ancestry.com online research. I learned quite a few things that I was previously unfamiliar with. I was tired come the end of the day. It was a full day even for a virtual attendee. But perhaps not so exhausting for me as the in-person attendees. I was able to sneak into the kitchen for food whenever I got hungry instead of being left to find something from a vendor or restaurant. Bathrooms breaks were no problem and my walking was limited. But I did miss out on the excitement and networking that all the attendees in Salt Lake City are enjoying. However, given the circumstances I was pretty satisfied with my first day. Recently, I received a warning from Facebook telling me not to "friend" anyone I don't know. I was a little surprised to get the notice but it turned out to be a good exercise in clarifying a few things for me. When you receive a friend request in Facebook you have 3 choices: 1) Ignore it and do nothing 2) Press the "Not Now" button which is pretty much the same as ignoring it or 3) Press the "I Don't Know This Person" button. I have always reserved the "I Don't Know This Person" button for people I didn't want to have friend me again. I didn't feel very strongly either way about them. It was sort of like using block in Twitter or Google+. It's not that I wanted to report them. I just didn't want to hear from them again because I didn't think there was a good fit. I suspect that something has changed in Facebook (who knows when but my guess is right around the time they started public subscriptions) and this button is now sort of a report button for nefarious people who have the audacity to friend people they don't know. As you can see from the warning above that Facebook is taking this very seriously. Facebook is making it too black and white and as usual not telling anyone what the rules are. I mean, how many of you knew that if you used the "I Don't Know This Person" button that you were reporting somebody and they could get blocked from Facebook? I certainly didn't. But Facebook is also not considering all the gray areas. What if you meet someone at a business or genealogy meeting. You send the person a friend request in Facebook but the person forgot that you had previously met. You really do know the person but now the person has reported you by pressing the "I Don't Know This Person" button. And what about high school friends? One of your good female friends from high school sends you a friend request. She's using a little cartoon instead of a photo making it difficult to recognize her. Also, she now has a married name which you don't recognize. Will she be unfairly blocked by Facebook because you thought you didn't know her? The gray area examples could go on and on. I wish Facebook would come clean when they make changes like this. Instead they use a very subtle, almost unnoticeable approach. In this link, notice how they've added some extra text? Facebook didn't use to say "If you know....," send a friend request. Before all you had was the send him a friend request link. Another murky area is unanswered/pending friend requests. The ones that others have sent and you have ignored. I must have pending friends requests that I sent from when I got on Facebook 4 years ago. The funny thing is Facebook won't help you remember who you have sent requests to. You need to do that yourself. You can cancel friend requests but only if you can remember the name of the person you sent it to. Very strange. Facebook's new policy has made it a little tougher for genealogists. And only because they haven't explained the rules. (One solution I can recommend is to head over to Google+ where you won't have this problem). The next time you receive a friend request think carefully before you press the "I Don't Know This Person" button.You might inadvertently block an otherwise friendly genealogist. But ultimately it's your call. To learn more about friend requests on Facebook visit their Friend Request Help Center page. You many also want to visit their Community Standards page. This is what they are trying to protect you from. This past weekend I was reading some genealogical books and journals. I like to read books on methodology as well as peer reviewed journals in order to get new ideas on how to solve my old problems. Sometimes it's not even the specific topic but just the jogging of my mind that gives me ideas. As I was reading, I suddenly thought about how I could expand my New York brick wall research in a productive way. At the start of 2012, I published my genealogy goals on my blog. One of them was to tackle my brick wall ancestor, William Edwards, of New York. Previously all my research had focused on my ancestor and his descendants. During my reading this weekend I realized it would be worth the effort to broaden my reach and focus on FANs - friends, associates and neighbors. In other words I could do a little cluster genealogy research. My process when starting research is the same each time. I like routine and strive to find efficient and successful tactics. I tackle research with a Think - Plan - Execute approach. First, I get an idea about how I can tackle my problem and then I think it through. In this particular case, I realized that the main piece of information I have on William is the 1800 US Federal Census which shows his arrival in Charleston, Montgomery County, New York. This is the area where the family would settle. My ancestor disappeared after 1808. The more I considered my problem, the more I realized that I should be taking a closer look at the neighbors that appear on the census. 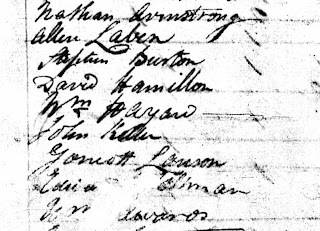 Even though my ancestor disappears in 1808, perhaps these gentlemen stayed on the land for many years and left records behind. I got an idea that I would research five neighbors before and five neighbors after William Edwards as they appear on the 1800 census. Perhaps if I looked at the land records of these men I could find a reference to my ancestor's land even if William was no longer living. It seemed like a good strategy to potentially open up some new leads. 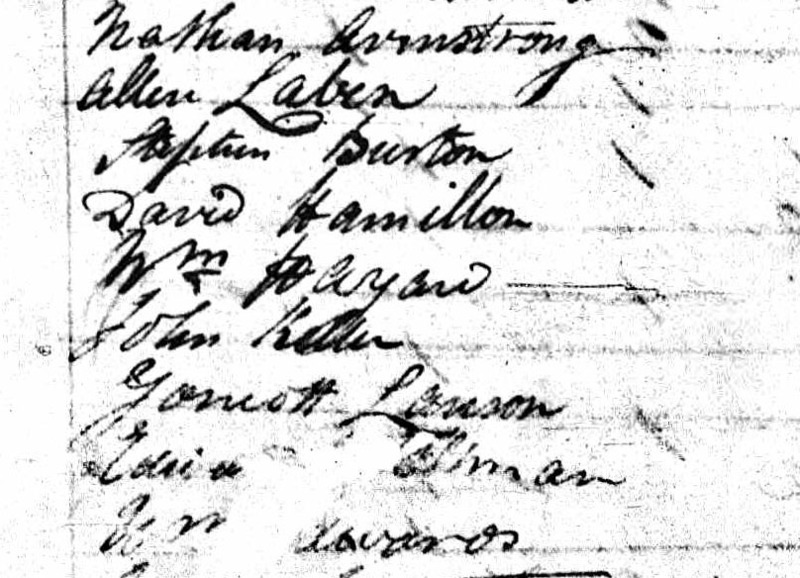 Then I decided I should probably check census records for these men as well. Maybe I could determine how long they were in the area. Of course, if I really wanted to expand the research I could add in all the early allied surnames. The people who had married into the family and developed long lasting associations. Keep in mind that this is just one research goal. It doesn't go into all the past research I've done nor the other ideas I hope to do in the future. One of the important parts of "thinking it through" is determining whether the plan is logical. Does it make sense? Will it lead to potentially to new information? Will that information be helpful in furthering the research? If you believe that it will then continue. If you're not sure, discuss it with another genealogist and get their feedback. In this case I think the exercise will be helpful to me so I will proceed. This wraps up my process of thinking it through. It may not be complete (or successful) but it's a concrete idea that I can develop into a plan and then execute. The next stage for me is to pull out my books and learn what records are available and where. I will arm myself with this information and create a research plan. After my research plan is complete I can move on to determining when I can execute my plan. In my next post, I will take you on the journey as I develop the research plan. Yesterday, my friend Linda in Australia asked me a great question - "Do people prefer comments on their Blog post where stats are available or on Google+ where there often is a larger audience?" This is such an interesting question and I'm sure that many bloggers will have different responses. I love to get comments to my blog posts. I will take them where ever I can get them. That means sometimes people leave comments on Facebook, Twitter, Google+ or in the comments of the individual blog posts. I will read them all no matter where they appear. From a practical standpoint, the blog post is the lowest common denominator for all blog readers. Everyone (except for those using an RSS feed or blog reader) will see the blog post and the comments. That means that anyone reading a blog post will see the comments shared by the other readers. This is helpful when a great dialog starts in the comments and the readers start sharing with each other. Sometimes the comments are better than the original post! When people leave comments on Facebook, Twitter or Google+, the only other people who can see those comments are the other people on those sites. There might be mini separate conversations on Google+ and Facebook. Of course, the people who don't see comments at all at the ones using a blog reader or an RSS feed. It's a matter of the mechanics of how those programs/feeds are set up. I understand that using a reader or feeds is easier for organizing and quickly reading a number of blogs but the sacrifice is the lack of comments. In fact, I wrote a whole blog post on this topic. So my answer to the question is more people will see the comments when they are posted in the comments section of the blog but I'm not fussy. I'm happy to get comments where ever readers want to leave them. I want them to do whatever is easiest and most comfortable for them. Photo Credit: Photo by Search Engine People's Blog and used under the creative commons license.